All our frames are prepared using the finest quality materials. Please explore our pages to discover the wide range of products & services we offer. No VAT to pay on all 2019 orders. Free collection & delivery for Warrington addresses. If you’re local, choose your frames & mount styles in the comfort of your own home or place of work. We also cover Knutsford, Northwich and Frodsham (nominal delivery charge applies). GCF Accredited member of The Fine Art Trade Guild. Promoting the best in art and framing. ​We are the only local Guild accredited framers. One of a number of fantastic cycling jerseys for Sir Bradley Wiggins. 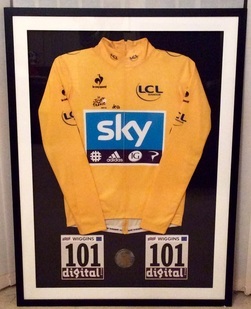 Absolute privilege to put this piece of cycling history together commemorating his 2012 Tour de France victory.